Stardeck is a 5-suited deck of playing cards. The fifth suit is a black and red star. The Suit of Stars brings 13 new cards to the traditonal deck of 52 cards and brings the total to 65 cards. Stardeck players can play 8 players in one hand, rather than 7. Players can deal longer without having to shuffle. Also, players can get better hands, such as the Five-of-a-Kind. 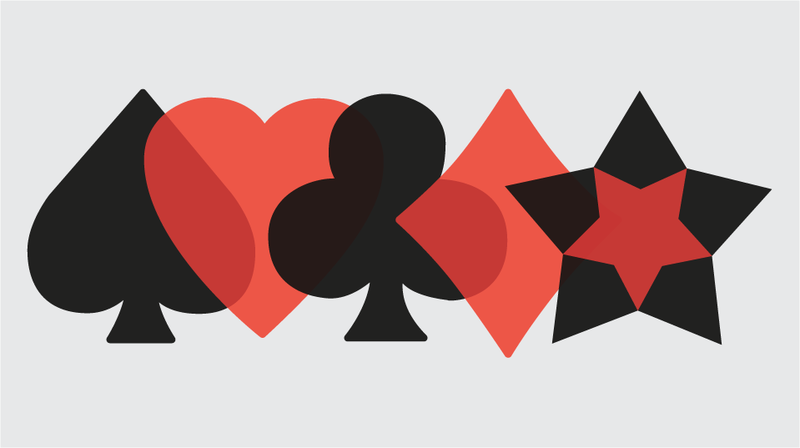 In Poker games, Stardeck players can play 8 players in one hand, rather than just 7. Players can deal longer without shuffling and can get new hands such as the 5-of-a-Kind and the SUPER Straight. 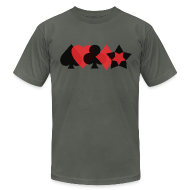 The fifth suit also allows for interesting Bridge, Spades, Hearts and Solitaire games. We have new women’s and men’s t-shirts available! Please check our new American Apparel t-shirts below.